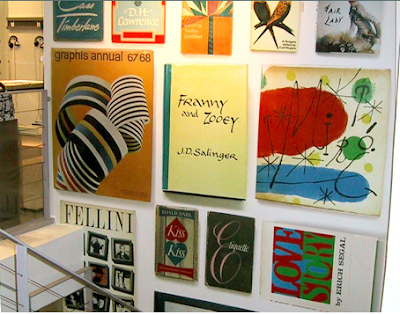 Andy Spade, husband of Kate, is also established in the world of design. 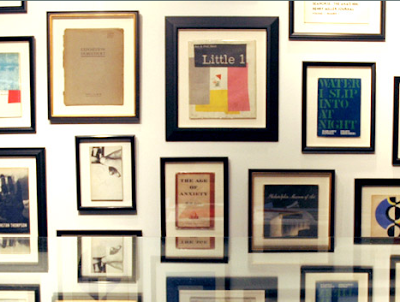 His store, Jack Spade, is full of products that men turn to for reliability, style and design. I was really interested to check out Andy's clever art exhibition he held a few years ago at the French boutique, Colette. His idea of "looking at books instead of reading them" was eye-catching and resourceful as art. Again, using the walls as a defined space, create your own gallery to showcase color and depth. Frames work great too! 1 Response to "ANDY SPADE: Clever"